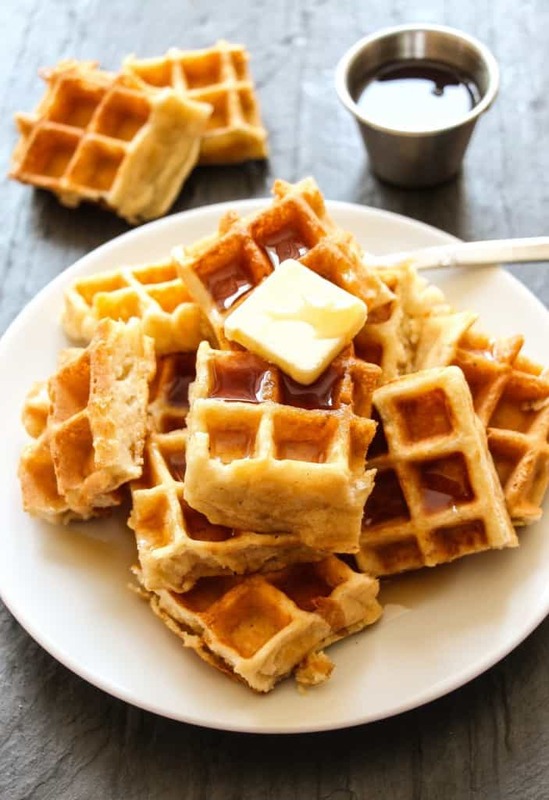 This is a recipe for our favorite homemade waffles – slightly crispy on the outside, and so light and fluffy on the inside that they melts in your mouth. 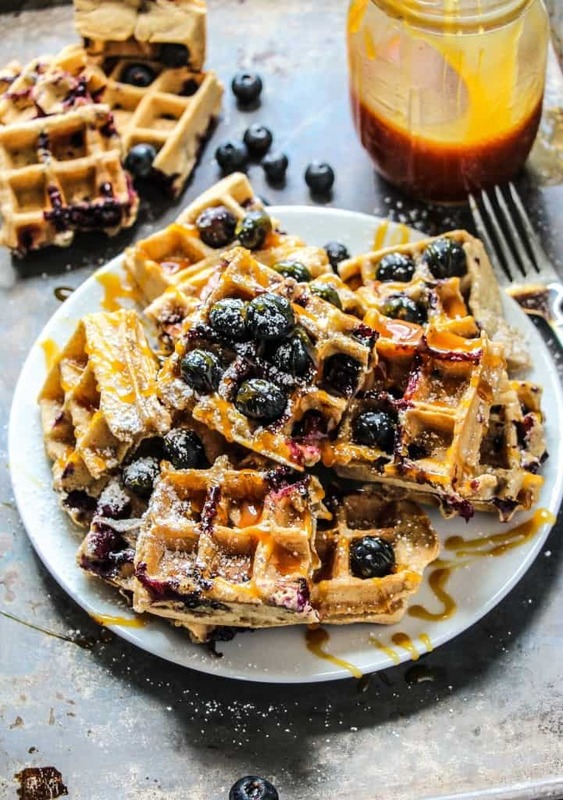 These are the ULTIMATE homemade waffles. Best way to spend a Saturday morning? Making huge stacks of waffles, covered in melty butter, a cascade of maple syrup, and lots of powdered sugar. 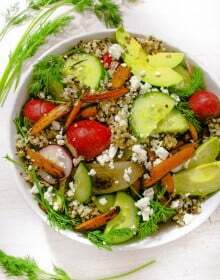 😉 Serve it with a bowl of fresh summer berries and you’ve got yourself one yummy breakfast. 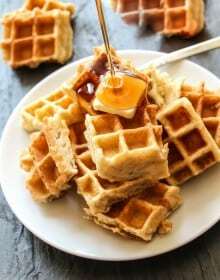 BUT no one wants a tough/dry/flavorless waffle – we all want a super light and fluffy, slightly crispy, melty waffle to indulge in. Well, I have finally done it! After testing lots and lot (AND LOTS.) 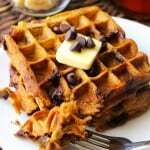 of waffle recipes I have finally found the winner. Before my search began, we hardly ever used our waffle maker. (I know.) We store ours in the top cabinet and most of the time we completely forget it’s even up there. I can assure you that will no longer be the case – after making waffles so much lately, I don’t think I will be able to go back to making pancakes ever again. How come I never realized how easy/quick waffles are?? And how much more yummy than pancakes they are? We tried all sorts of different techniques like, adding butter instead of oil, more milk, more flour, egg whites beaten to stiff peaks, baking powder, both baking powder and baking soda and on and on and on. Everyone swears by the egg white method, but I actually found that they waffles were almost too airy and it took so much time to whip the egg whites! 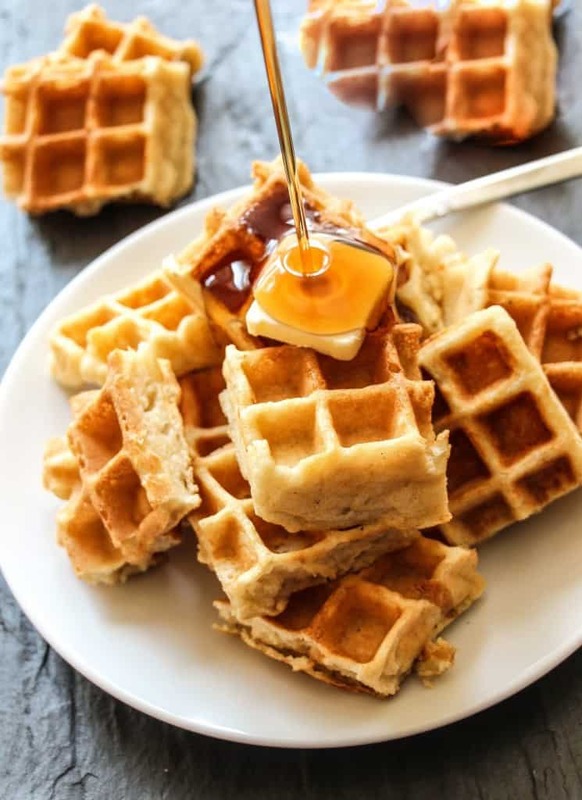 What we ended up with was a soft, fluffy, light, sweet, flavorful, slightly crispy waffle that literally melts in your mouth after being dunked in a maple syrup – just like the ones you get from hotels or waffle houses. Perfection. 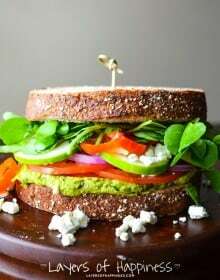 In a large bowl, combine flour, almond meall, sugar baking powder, cinnamon and salt. Set aside. 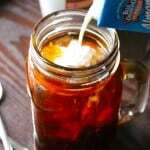 In a small bowl or liquid measuring cup, whisk together milk, oil, eggs, and vanilla; until smooth. Gently fold the milk mixture into the flour mixture and stir until smooth. It is okay if the batter has a few lumps. Do not overmix. 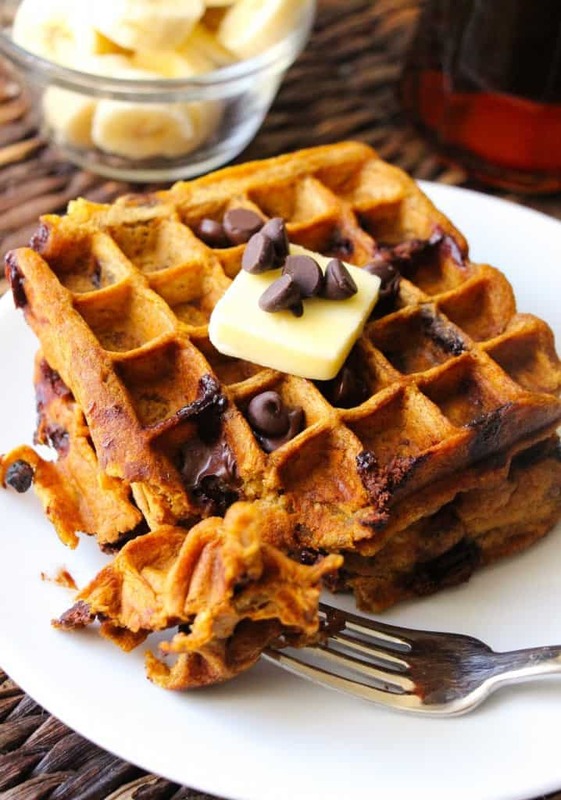 Pour batter onto hot waffle iron and bake in batches. 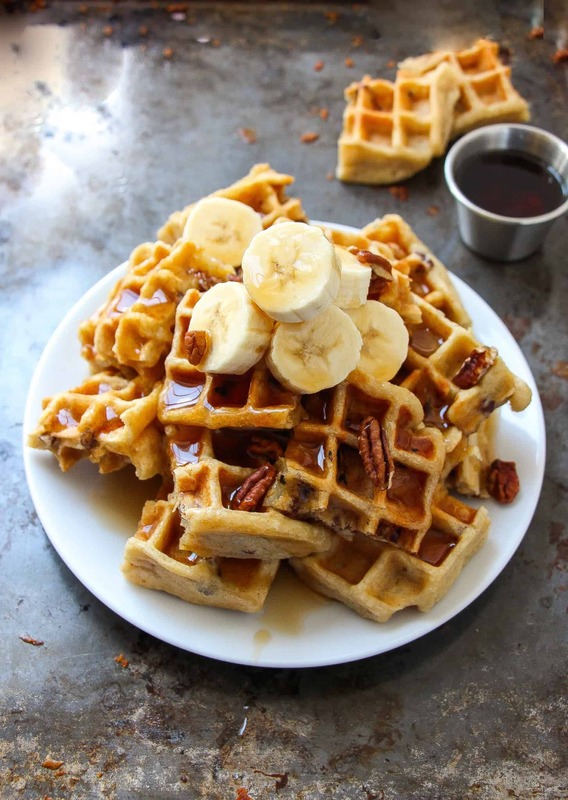 Serve the waffles immediately with butter and maple syrup, or your choice of toppings. Waffles are best enjoyed the same day. 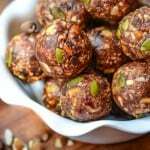 Extras may be refrigerated up to 3 days. Waffles may be frozen, up to 3 months, then warmed in the toaster. I tried these this morning. I ran out of sugar and substituted coconut sugar. They came out fantastic!!! I had a bit of an issue eating them as I took them out of the waffle iron…but I did end up with extra to freeze. SO happy you like them as much as we did 🙂 So happy to hear coconut sugar worked! I’ll have to try it! 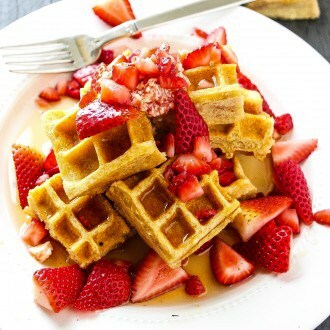 Question…for melt in your mouth waffles. ..Where can i purchase. Almond Meal??? Never heard of this..or baked with this..Also any pointers or tips when using almond meal? Yay! So happy you liked them! 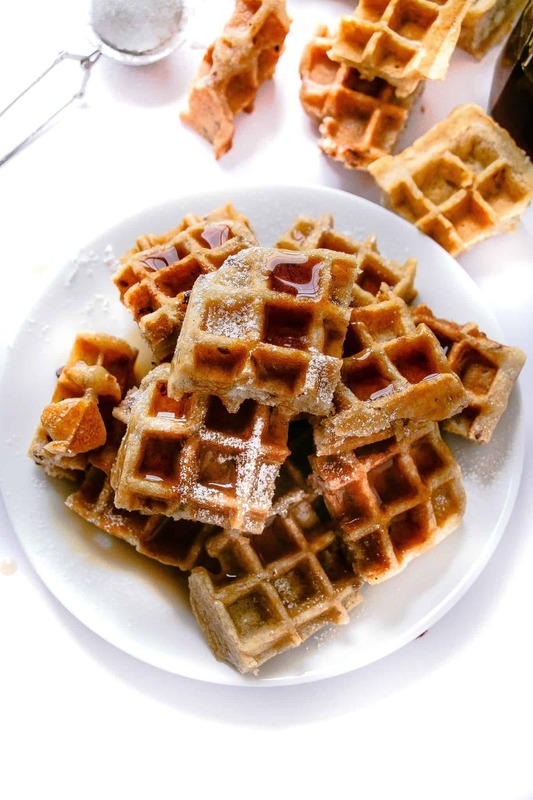 We love waffles also and I make mine with 1 cup of flour and 1 cup of whole wheat pastry flour. 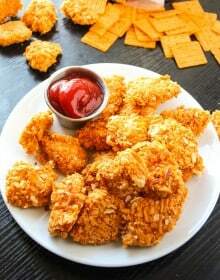 I also use buttermilk. 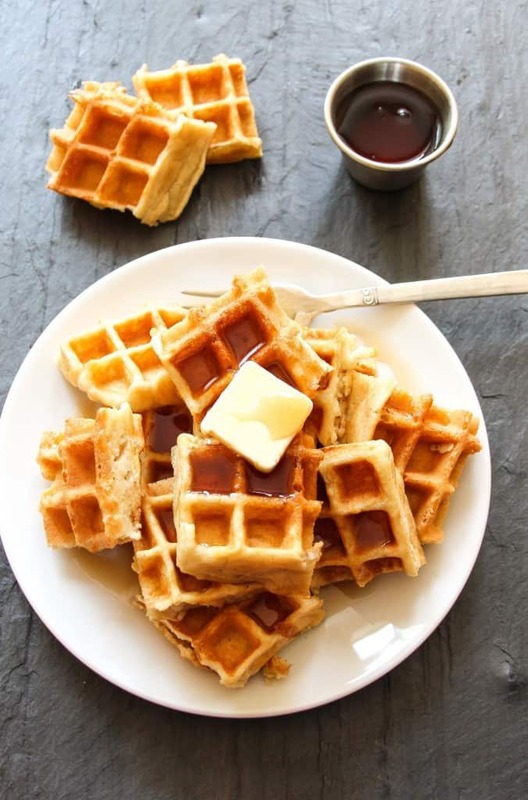 Could you use buttermilk with these waffles? 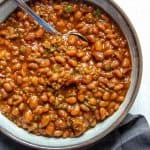 Just wanted to let you know that we’ve been using this recipe for the past couple months and they are DELICIOUS. Even when we have guests, we have so many compliments on them (which we tell them is from this blog). Thank you for sharing! 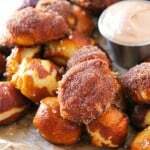 Can you omit the cinnamon?… Or can what could be substituted for it? 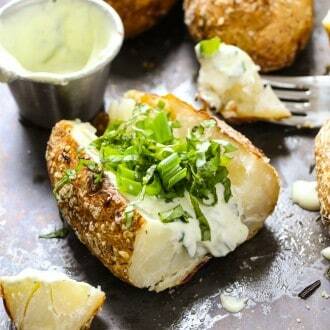 Yes you can omit, the cinnamon is just for flavor! BEST WAFFLE RECIPE EVER!! I was wondering if the batter was fridge stable over night? 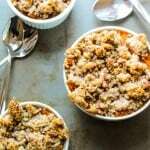 I had a mini panic this morning when I realized I forgot to pin this recipe after making (and loving) them last weekend. We had them for breakfast again this morning, and they are my new go-to! So easy and yummy 🙂 Thank you!!! Haha! So happy to hear!! How many waffles does this recipie make?